We might stop there and say “21,000 web pages is enough evidence for me”, but WHEN did Einstein say it? WHERE? No one seems to know. A large number of these quotes seem respectable enough – many are on university web sites, computer science portals, and in textbooks. The quote was even used as the motto for Super-computing 2006 and used in the key note speech. It seems in fact to be everywhere except in any book, paper, speech, or a citable source by Albert Einstein. By this point I’m 99.9% sure he never said it – but lets keep looking. Wikiquote (a wikipedia project) tries to track down the actual original source of all quotes lists the “powerful beyond imagination” quote as on of its unverified on the talk page. No verified quote mentions computers at all. So in this case the web is no help, so let’s try books. So I switched from Google web search to Google Book search. Book authors normally spend a little more time researching before they publish…most of the time. I was able to find the quote in over 190 books that Google has scanned. Unfortunately the full text is rarely available. Interestingly, most of the newer books – after 2004 readily attribute the quote to Einstein. But no book actually about Einstein mentions the quote…or anything else about computers. The ENIAC (Electronic Numerical Integrator And Calculator), began construction in 1943 and was completed 1946. It occupied about 1,800 square feet, used about 18,000 vacuum tubes, and weighed almost 50 tons. When it was turned off in 1955, (the year Einstein died) its estimated to have done more arithmetic than the entire human race had done prior to 1945. That IS a lot of math, maybe its possible Einstein said it after all, but we still need evidence. 1955 John McCarthy coins the term Artificial Intelligence (AI) in 1955 at Dartmouth University. 1955 Tim Bernes-Lee is born June 8, 1955. 1955 William (Bill) H. Gates is born October 28, 1955. 1955 IBM introduces the first IBM 702. 1955 Bell Labs introduces its first transistor computer. Transistors are faster, smaller and create less heat than traditional vacuum tubs, making these computers more reliable and efficient. 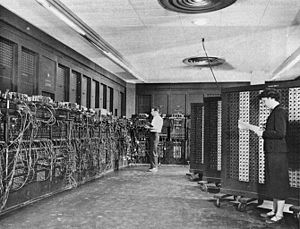 1955 The ENIAC is turned off for the last time. Its estimated to have done more arithmetic than the entire human race had done prior to 1945. So if not Einstein, then who? The Computer is incredibly fast, accurate and stupid. Man is unbelievably slow, inaccurate and brilliant. The marriage of the two is a challenge and an opportunity beyond imagination. Let’s just find the oldest damn reference to it! People use quotes as a way to strengthen their own position. If I can quote someone you respect, it adds credibility to whatever argument I’m making. Over time, the truth gets further and further away. The biggest names have always attracted people who are more than willing to put words into their mouths for their own gain – Confucious, Jesus, Aristotle, Shakespere, Einstein, and the biggest, most misquoted, of them all – God. All of them have probably been quoted more for the things they never said, than things they actually did say. I imagine this is the most disappointing part of time travel, waiting around to witness words never spoken and deeds never done. Wow, that’s the incredible fact checking! Thanks for doing research, and sorry for spreading the lie. I’ll make a blog post about this soon. I went around the web and posted comments to about 10 blogs that had this quote including blogjet to ask them to change it. I fear the genie is out of the bottle now though. The internet allows truth to be both created and destroyed. Created in rumors and destroyed through research. The scary thing is that both fact and fiction can live together so peacefully. Librarians constantly run into this… there is a striking quote … somebody tweaks it a little to make it more like what they like, then it is attributed to someone, usually famous, or relevant to what somebody thinks the quote is about. These things unravel all the time once somebody looks for proper attribution. But I was looking this one up because of the dust up over the resume of the CEO of Yahoo. He went to Stone Hill College–check out the top of their computer science page! Computers, or internet as we know it, could simply process the sum of “12,100 results” and present an affirming notion that, yes it was Einstein’s words, and it’s a “fact”. However, humans acquire the intuition, and driving motivation, in order to sense the depth of human behavior — for instance understanding “quotes as a way to strengthen … position” — and later on, to investigate the truth. How long did this investigation take? Wow! … I was one of those sites you left a comment at and followed the link here. Thanks for the info. 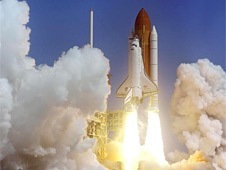 I read that the time it takes for ideas to spread is approaching zero – compared to the hundreds of years it used to take for new ideas to travel from places like China to Europe and beyond. Thanks Ben! I was just embarking on the same avenue of research on this quote (which I didn’t buy either, for the same reasons as you), but you just did the work. And in a splendid fashion! Peter – That is ironic. It seems in this case, that collective wisdom leads most people to believe what they want to believe (or perhaps what is convenient to believe). The trouble is, despite the power of the internet, there is an inherent weakness caused by the fact that we *believe* the internet is comprehensive if not always accurate. We believe that if we keep looking, that somewhere – amongst the billions of pages, the answer must be there, somewhere. The truth is, even once Google completes its mission of indexing every book, magazine, newspaper, and candy wrapper, there will *still* be missing knowledge – that which is unknown, unknowable, or known incorrectly (in order of increasing danger to society). The “nothing new under the sun” misnomer keeps most smart people searching when they should be inventing, discovering, or thinking for themselves. Some people need to search more, others need to search less. My rule of thumb for small stuff like this is give it 1 hour of Google searching across all their knowledge domains – if you can not find the information scent in 1 hour, hit the lab, the garage, or the workshop because what you are looking for either doesn’t exist, or its sufficiently obscured that it will benefit from your unique point of view and research. do you know if he really sid that and when??? Did you try some local libraries to find out if there is a copy of Advances in Instrumentation in your area? I notice you are in Houston. The University of Houston has the issue you need. You can do searches in http://www.worldcat.org to find libraries who have books and articles. You can put in your zipcode and get results back for libraries closest to you. Thanks for doing research, and sorry for spreading the lie. I'll make a blog post about this soon. Thanks for sharing the information. I am very amazed at the confidence level of you guys, so i have to refer your blog to my friends because it’s really a help full blog. Nice research….who ever said it is absolutely perfect one………. Thanks for posting this. I just read this quote in an article on the Huffington Post : http://www.huffingtonpost.com/carl-honore/in-pr… and I immediately thought that Einstein couldn't possibly have said it. The behemoths he might have been familiar with were being used to calculate missile trajectories – not even an area a pacifist like Einstein would have sullied himself. Even if the computers of his day were not the size of Walmart, his thinking, which was largely intuitive and visceral, would not have required them. None of his fundamental research was computationally dense, except in symbol manipulation. 2. Couture, H. D. and Keyes, M.A. (1969). A paper industry application of systems engineering and direct digital control. Journal of Advances in Instrumentation, V. 24, Part 4, p. 691-4. I don't think that BlogJet is the best to try webs on. I'd rather tell you to try Drupal solutions because they manage sites, either they belong to Rupert Murdoch or to anyone. And of course Einstein never said that… because he wouldn't agree with internet first of all. The end of the following article attributes the pseudo-Einstein quote to Leo Cherne in 1968; if accurate, it may be earlier than the 1969 Advances in Instrumentation quote — one would have to determine when the authors of the latter article wrote it. The citation is: Remarks by Leo Cherne at the Discover America Meeting, Brussels, June 27, 1968. I have not yet found further references to that meeting. Thanks for this! Took me forever to dig the article up even in this day and age but worth it. Much appreciated… I strongly suspected this was NOT a quote of his – as I frequently refer to his sayings. Im glad I didn't have to dig as much as you in order to prove my point to a fellow misquoter. Thank you for this research. I have forwarded the link on to the creator of iGoogle's 'Einstein Quote of the Day' widget, after seeing this quote on it and wishing to discover the origins. I have the Einstein quotes of the day on my desktop and after reading this one thought that gee I didn't know computers were around at the time Einstein was alive and were FAST. I am glad there are people out there who were smart enough to figure out that Einstein probably didn't say that and have done some actual research. Thanks for posting this. I thought it was very helpful and also informative as to its possible origin. Computers are extremely fast, accurate and stupid. Human beings are notoriously slow, sloppy and highly intelligent. When the intelligence of humans is coupled with the speed and accuracy of computers, data processing that far outreaches anything in the past becomes possible. Robert O' Conner, Journal of Occupational and Environmental Medicine, April 1968, Pipping Cherme by two months. they all said the same thing with such consistancy. Came across your blog on the Einstein computer quote while researching another, ascribed to AE without citation numerous times on the net: “I never came upon any of my discoveries through the process of rational thinking.” So far, I've written a dozen people, including the Princeton U Library. It isn't in the “new quotable Einstein” book, and not listed in the wikiquote discussion – although I've posted a query. Thanks for raising the bar, Ben. I’m here due to the same quote making the rounds right now. I’m pretty sure Einstein used rational thinking in his discoveries, so it seems unlikely he said that one. I agree it’s disturbing when someone attributes malarky to a genius of rationality like Einstein. You’re right – the quote in that form does not appear in print until 2000 (according to a search of Google Books – http://bit.ly/13cMQ5B ). He might have said it though, the phrase “rational thought” is term philosophers use to distinguish pure thought experiments, from real world observational experiments. In addition, you scientists and people who think about the process of creative, innovative discovery often cite the importance of being completely wrong-headed in your thinking in order to muster the confidence to trace an idea to its logical conclusion and stumble on a new discovery. Here is a tip, don’t search for “Einstein” and the quote. Instead, search for the quote or part of the quote and see if you can find the real source or earliest reference to it. Quotes morph over time, usually becoming simpler. Let’s call it the Einstein Principle: Any idea from any scientist in the 20th century will eventually be attributed to Einstein. I would check out physicist’s Fritjof Capra as the source of that quote. He wrote the book the “The Tao of Physics”. I’m pretty sure if someone as famous as Einstein had said it, someone would have used it before the year 2000. There are hundreds of books on the nature of science, rationalism, the mind, and creativity that would LOVE a quote like that written before 2000. A really great post, an interesting point well written. I'm glad I didn't just take the UK government at face value and borrow a quotation from one of their publications without checking the source now! Not only do I have a more accurate reference, the article quoted below by David that contained the original Chene reference has made a perfect introduction to my dissertation proposal on ICT in Education. Cheers guys! A great bit of detective work. I admire your perseverance and am certain that you will yet reach the actual source. really enjoyed reading this thanks! I was looking for the date that he said this, only to find your article saying he didn’t. I will use the 1969 date instead. Thanks again. Regardless of who said it I like the fact that it is old when computers are no way near as fast as they are now. Thanks for sharing the information. I am very amazed at the confidence level of you guys. Very well done, thank you. I’ve read loads of A.Einstein’s work and never heard/read that quote. An associate of mine used it and I was taken-back – due to the year of Alberts death. This shut him up and earned me a few pints. Anyway it’s a really truthful and nice quote, anyone said it. I read that “quote” and saw it attributed to Einstein and questions popped into my mind. It didn’t seem likely, even a a quick glance. Thanks for the research. @AlanWR that was my initial reaction too. I came across the quote on someone’s blog and really liked it, but was surprised to see it attributed to Einstein, so I thought I’d poke around and I found this article. GREAT research, nice job Ben. An admirable piece of philological investigation, in the line with Merton’s “On the Shoulders of Giants”. But by 1955 computers were already tens all around the world; most of them much better than ENIAC. See for instance M.R. William’s “A History of Computing Technology”, R. Rojas, “The First Computers. History and Architecture” or any good computer chronology on the web. You’re right to be. Vasty amounts of bull or out of context quotes used to prove that Dead Famous Person X supports one’s own politics or religion. they can only give you answers” – by Pablo Picasso. He was referring to an abacus or an adding machine… not our familiar pc, nor it ginourmous predecessor.I agree – it’s annoying to find a quote attributed to somebody, and the quote and/or attribution is all incorrect. 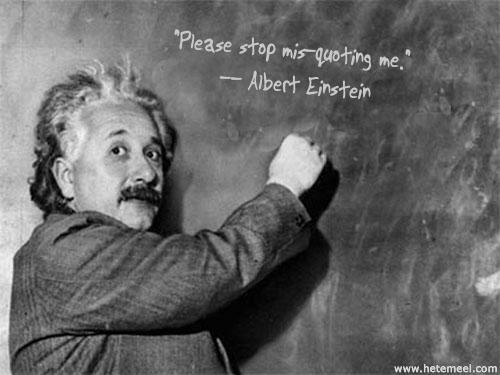 I saw this quote attributed to Einstein and immediately became suspicious. Einstein died when computer was still at its infancy, and Einstein never grew up with it. It would be kinda odd for Einstein to say that. Not to mention Einstein’s more famous quotes attributes stupidity to humans, not brilliance! Well done – I saw this whilst installing BlogJet too – and like you was suspicious of its validity. As you say misquoting to somehow strengthen their case. Would it be churlish of me to un-install their trial and never buy it…? Just heard the quote today listening to a keynote talk – and also could not believe that it was attributed to Einstein. Hence I came across this page and would like to express my respect for your accurate work! Well done. Nice research! Searching google books just for the words “computers”, “fast”, “accurate”, and “stupid” (since this seems to be common to all variants found so far) and restricting the date range to before 1968, I found what I think may be the original origin of the saying–an article titled “Problems, Too, Have Problems” from the October 1961 issue of Fortune magazine. A snippet from p.53 of The Current I found here quotes the Fortune article as saying “Man is a slow, sloppy, and brilliant thinker; computers are fast, accurate, and stupid.” A little more searching reveals the article was written by someone named John Pfeiffer, and I found two other early sources from 1962 that credit Pfeiffer with the observation that computers are fast/accurate/stupid (I put the links in the entry for this quote in the “Talk” section of the Einstein wikiquote page–the “Talk” section has a lot of other supposed Einstein quotes that need to be sourced or debunked, and the Einstein page itself has a lot of false quotes in the “Misattributed” section). If it sounds like a fortune cookie – Confucius said it. If it sounds like science – Einstein said it. If is sounds political it was Thomas Jefferson. Eventually the the public will consolidate all knowledge and wisdom to a quote by a single person. I’d really like to be that person. Einstein, Jefferson, and Confucius stole all their quotes from Oscar Wilde. It ought to be Harpo Marx. Excellent research. I saw this on a Google Einstein Quote of the Day and I wondered about that and came across this. I, for one, like quoting from authors I’ve read and yes, big people too. I really admire your research to find truth on this seemingly simple matter. If only everyone was as critical about truth and as inquisitive as you are then maybe we’d have better politicians holding offices, better house hold products, healthier food choices… yah, pretty much a better world in an macroscopic note. Hope you do find the real author, I think that would be a treat. I did the google for the same reason as you did.. Thankfully hit ur post!! Jokes set aside, good work. I applaude you. Well done. Nothing annoy’s me more than some flippant one liner dream’t up by the user. In my case a friend of mine on ‘Facebook’ posted the horrid quote just this morning. Much to my displeasure. Every thing in my conscious being screamed out in pain the moment I read it! Followed by further disgust as I saw the number of ‘Likes’ it received. But I don’t think she got it? Great work! I hate people that put false quotation in their post! Thank you very much. Weird or what!?! I just needed some scrap paper and came across an old essay of mine (1992, yes, I am a ‘keeper’). The quote struck me as really good, I wanted to know more – and landed here. Unfortunately, the bibliography page has gone… but the name I have is John Higgins, and (from another footnote) it is possible that my quote came from a book called Language, Learners and Computers (1988). What I also think is quite funny is the fact that there are so many different forms of the same quotation. Mine is quite sober and academic (no ‘incredibles’ or ‘marriages’), but simply: “It has been said that the computer is fast accurate and stupid. Humans are slow, inaccurate and brilliant. When we are able to combine these effectively, te results will be unimaginable.” The “it has been said…” suggests that Higgins, too, had a problem about the source. lol, I know this is old but I started doing the very same thing you were doing and came across this post, still none the wiser. Keep up the good work, much appreciated! At this point, who should I credit for the misattributed version? I like it. I liked it a little more when it was attributed to Einstein. However, there’s a reason so many people use that quote. Part of its popularity must go to Einstein but part of its appeal has to be because it rings true. Whether Einstein or Popeye the Sailor said it, there is real meaning and wisdom in those words.